Owning and running your own business is an extraordinary achievement. The last thing you want is for that business to undergo any sort of harm, including burglaries. Break-ins can be expensive, stressful, and traumatic. They can even result in some businesses closing due to such high costs on top of the loss of whatever merchandise was stolen. 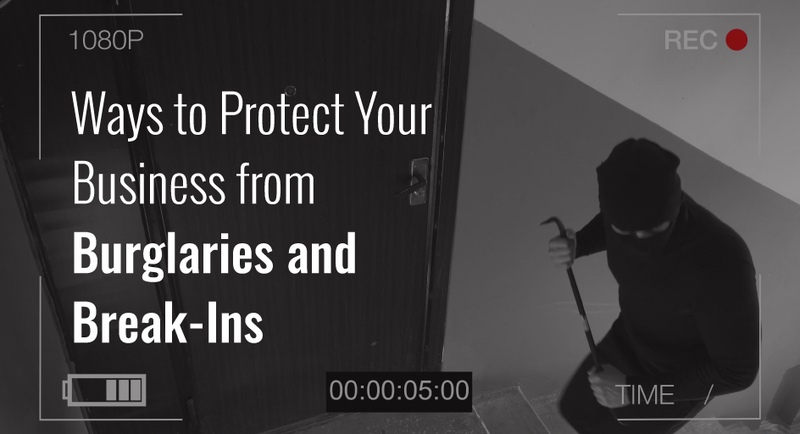 There are various steps your business can take in order to prevent burglaries as best you can. By installing lights outside, keeping your exterior neat, reinforcing doors, installing alarm and video surveillance, and establishing a community watch, you can feel confident that your business is protected as much as possible. Adequate and secure lighting will deter many burglars away from your business. To ensure your business has preventative lighting, install lights in areas that are not in plain view. Often enough, this is where burglars will gain access to the inside of the building. Be sure to use durable, well-examined lighting so that your lights are both reliable and will stand the test of time. It’s also best to install these lights inside bulb cages that can prevent them from being easily broken, whether by a burglar or the elements. Finally, be sure you’re maintaining your lights and replacing them when they come out. Installing protective lights won’t do you any good if burnt bulbs aren’t replaced. On top of ensuring your exterior is well lit, there are other preventative steps to take in order to impede burglars. Although you most likely already do this, shrubbery and trees should stay trimmed and neat — especially those in close proximity to the building — because they can provide excellent cover for someone attempting to break in. Your windows are also an easily accessible entrance into your building. Burglar resistant glaze can be purchased from various security companies. This glaze is built to hold against burglars attempting to break in, and is a wise investment as broken glass can ruin merchandise and is expensive to replace. This brings us to the next point, which is not to place valuable merchandise in your business’s windows. Unfortunately, paying customers are not the only kind of person this will attract, so it’s best to avoid the strategy altogether. Doors are another important factor in preventing break-ins. Having a sturdy, protective door will prevent many burglars from causing any harm to your business. Generally speaking, solid-core wood or reinforced steel will do the trick. In addition to this, installing deadbolt locks with heavy duty strike plates (the attachment to the door in which the lock itself goes into) will increase the security of any entrances very well. Of course, also be sure that the door hinges are located on the inside of the building so that they cannot be removed from the outside by potential burglars. An alarm and video monitoring system is the fail-safe plan to ensure that damage is minimized in the event of a burglary or break-in. With technology becoming more affordable every day, there is no reason why your business shouldn’t be reinforced with both types of security. Alarms are also versatile in use. They can be used to protect the perimeter or area of your business, where alarms are placed around the building and generally cover the outside surface of it. Area alarms will protect the inside of the building and are usually motion detectors of some kind. There are also object alarms which can help to protect against specific, valuable items like a safe. If any of these alarms go off, they will alert trained professionals who will contact the owner of the business and local authorities immediately to prevent as much damage as possible. Another aspect mentioned above is video monitoring. These services used to be fairly expensive, but prices have dropped significantly as new technology is developing. For a perfectly reasonable investment, business owners can install surveillance on the inside and outside of their building. You can even go back and review the footage as often as you want, because these systems can store massive amounts of footage. Some are even saved directly to cloud databases, in which unlimited amounts of video can be stored digitally. This isn’t just great for preventing burglaries, it can also help you and your staff feel safer throughout the day. Anytime handling money is involved, robberies are a possibility both during working hours and at night. Just like developing a good relationship with your neighbors at home, business owners should get to know those working in nearby buildings. By doing this, local businesses can keep an eye out for suspicious activity in the area. Much like a neighborhood watch program, this is a community system that has mutual benefits for anyone involved. Any time you get the opportunity to keep your community safe, do so! These tips are geared towards small business owners, but they’re also applicable to homes and anywhere else susceptible to burglary. Families can take similar steps to keep themselves safe from burglars. By doing so, they can feel secure in their own homes as well as their small businesses. Big life events like burglaries are stressful, and having financial strain on top of emotional distress can be disastrous. It could mean the difference in whether or not your company stays afloat. Make sure you have the right coverage in place so you don’t have to worry about that if the time comes. Our risk managers are trained in these areas and can help you when assessing what kind of coverage will fit your needs. Take the time and think about what’s important to you. Give us a call today and let us help you in any way we can.